In diamond, with loops on each arm of cross. Back loop. 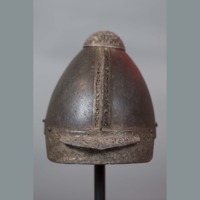 Known as a 'Nestorian Cross'. 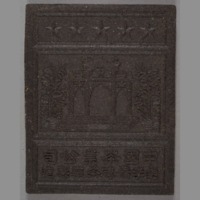 One semi-circular unglazed light tan earthenware tile. 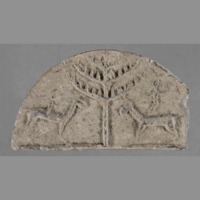 Obverse presents moulded motifs in the form of a central tree flanked by two stylised figures mounted on horseback. 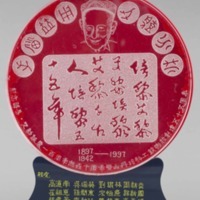 Perspex disc with red backing and engraved Chinese characters. 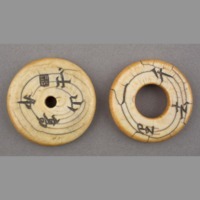 Disc sitting on perspex base with yellow Chinese characters. Backed with a clear perspex stand. 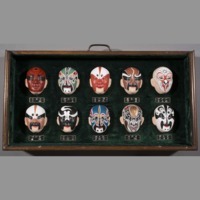 Presented to Rewi Alley on his 85th birthday, granting him the first honorary citizenship of Beijing in 1982. Personal seal of Rewi Alley carved in ivory depicting the traditional male lion with front paw on a sphere (in small case). 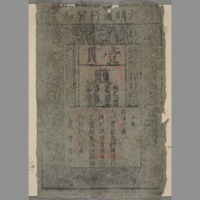 Inscribed 艾黎 (Aili) in seal script. 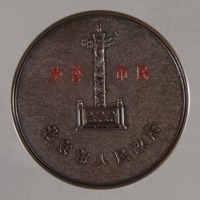 One circular bronze medallion. 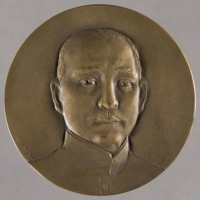 Obverse presents head and shoulders portrait of Sun Yat Sen. 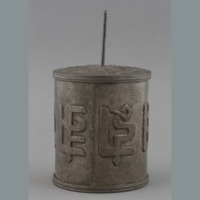 Reverse upper outer circumference presents Chinese characters within which is an illustration of a building in a traditional architectural style. 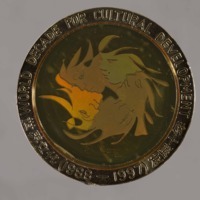 Gold plated medallion for 'World Decade for Cultural Development' (1988-1997). 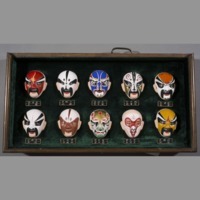 Depicts a hologram of four theatrical masks on one side. 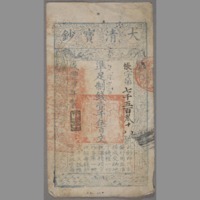 On reverse are three dancing women with ribbons and inscription. 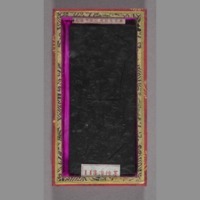 In pink velvet case. One glazed blue and white ceramic figure. 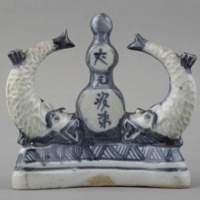 In the form of two fish with upraised tails flanking a central vertical form the obverse and reverse of which are emblazoned with Chinese characters. One furnishing for lower end of sword scabbard. White, ornamented with geometric pattern of squares. Three holes at top. 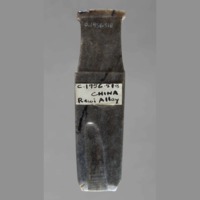 One ceramic shard. 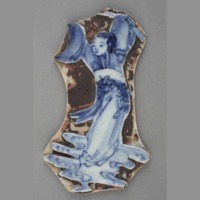 Obverse presents blue and white glazed design of a robed woman. 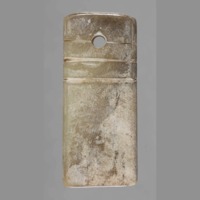 One elongated adze-shaped jade object. Blue-grey with darker blue vein. Upper extremity terminates in short handle and collar. 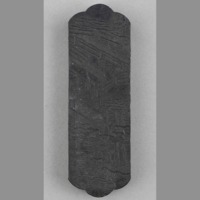 Obverse lower end presents chisel-shaped slightly-stepped concavity. 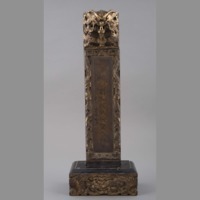 One triangluar white jade sword-guard. Grey-brown vein. 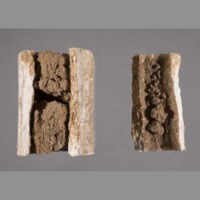 Narrow rectangular slot pierced through cross-section. Brown cord threaded through. 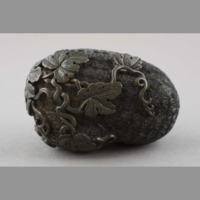 Obverse and reverse present shallow relief-carved serpentine patterns and an incised stylised animal head. 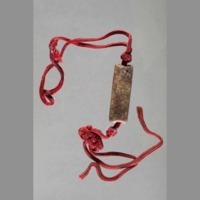 One cylindrical yellow-brown jade bead. Dark brown vein. Hole pierced through longitudinal axis. Threaded through with red cord knotted at either end to secure bead. 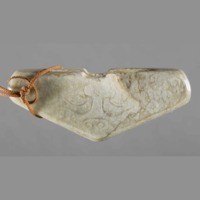 One adze-shaped jade object. White with grey-brown vein. 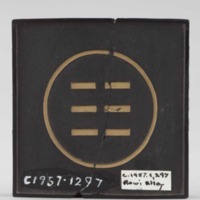 Obverse and reverse present band of six incised lines. Three holes in top with black cord threaded through. 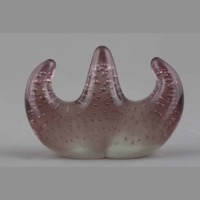 One tinted purple blown glass brush rest in the form of the head of a trident with rounded points - those on the sides curving inwards. Interior of object contains air bubbles. 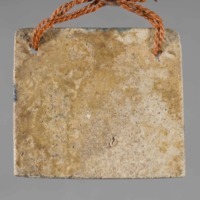 One yellow-brown carved stone pendant in the form of a square tablet. One side of the pendant presents two small holes piercing opposing corners and threaded through with orange cord. 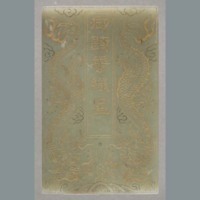 One short blade-shaped translucent white jade gui. Brown-flecked vein. Hole at the top. Upper third of body exhibits three incised lines; upper line intersects hole. 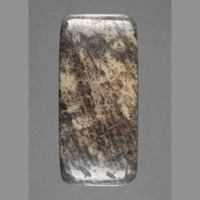 One circular roughly cut brown-flecked white jade bi. Four equidistantly-spaced projecting lugs on outer circumference. Medium-sized circular central hole. 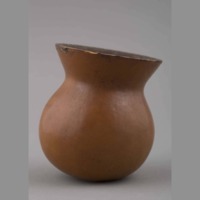 One yellow-brown vessel fashioned from a gourd. 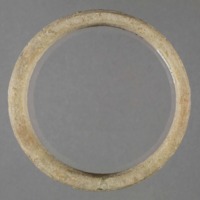 One circular grey-white jade ring. Yellow-green vein. Large circular central hole. 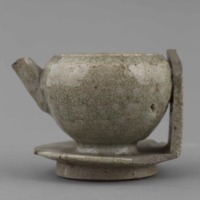 One grey-white jade sui. Yellow-brown vein. 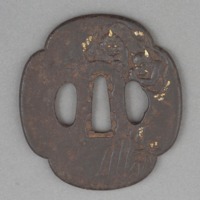 Obverse presents two incised characters. 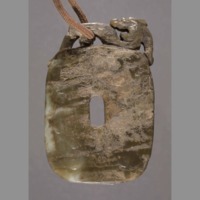 One green-white jade pendant. Yellow-green vein. Oblong-shaped with rounded corners. Small oblong hole in centre. Upper edge presents carved dragon decoration with brown cord threaded through. Obverse and reverse present serpentine patterns. 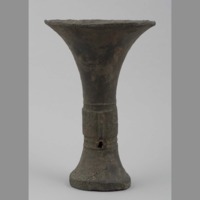 One crackle-glazed green-white ceramic oil lamp in the form of a wide-rimmed spouted globular body attached to a saucer-shaped base with a vertical handle. 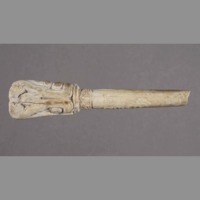 One elongated light tan and white carved ivory pin broken at the neck. 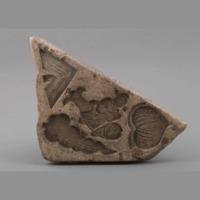 Head exhibits carved incised bilaterally symmetric design. 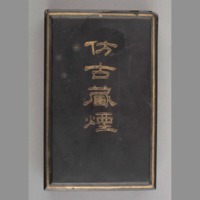 Presented in dark blue box with Chinese characters on lid and light blue interior lining. 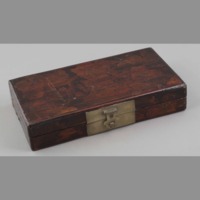 One red-brown lacquered wood box. Lid and sides decorated with a garden landscape design. Metallic-gold coloured hinges and clasp. 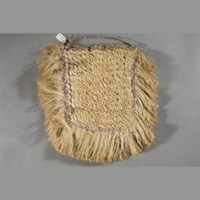 One green and brown embroidered pouch containing sixty two rectangular ivory counters for the gambling game zhuangyuan chou 狀元籌. 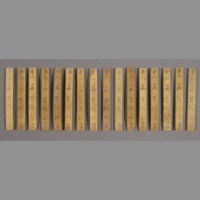 Various types of counters are engraved with Chinese characters and pictorial illustrations. 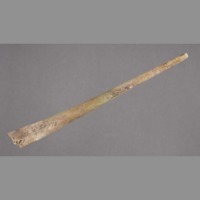 One long slender yellow-brown wooden back scratcher. 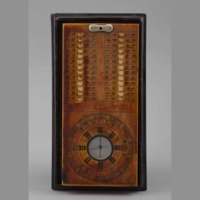 Central part of main body incorporates an abacus directly carved from the wood medium. 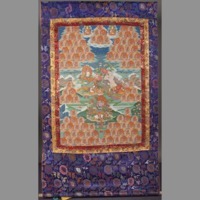 One vividly painted rectangular canvas monastery scroll. Obverse exhibits botanical border in purple and magenta surrounding a central design rendered in red orange blue and green. 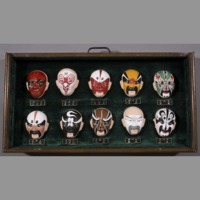 Buddhist theme. 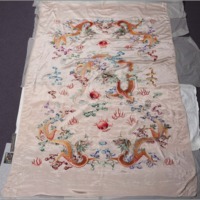 One rectangular pink-white silk sheet embroidered with a multicoloured design of five flying dragons pursuing flaming red spheres. 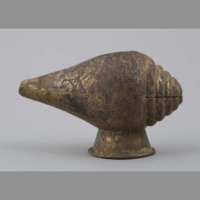 One gilded bronze imitation conch shell on stand. 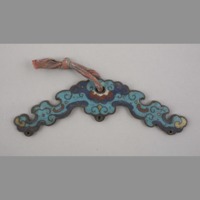 One chevron-shaped metal pendant decorated on both sides with ruyi patterns in blue red and yellow cloisonné enamel. 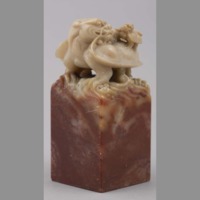 One red-brown and cream cuboid soapstone seal. 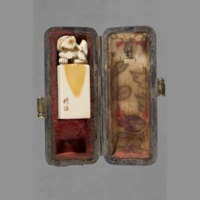 Predominantly cream-coloured upper end embellished with carved tortoise bearing a baby tortoise on its back. 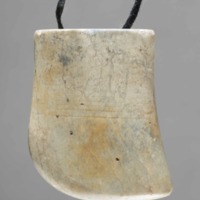 Bottom face carved with seal pattern. 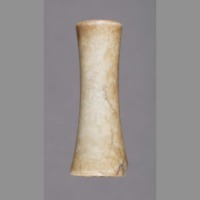 One yellow-brown hollow bone cylinder narrowing slightly at the waist. Exterior surface presents incised patterning. 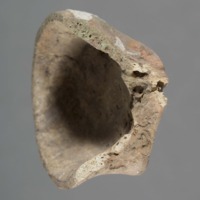 One cone-shaped hollow red-brown horn fragment. 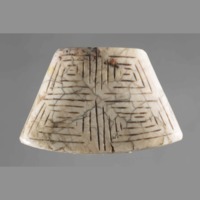 Exhibits incised geometric patterns near its base. 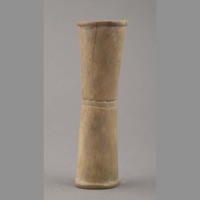 One yellow-brown hollow bone cylinder. Waist exhibits two parallel grooves incised around outer circumference. Flares slightly outwards towards the ends each of which presents a carved lip. 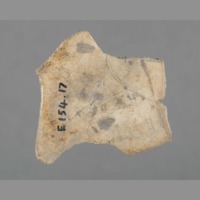 One cup-shaped light tan horn fragment cut from the coronet of a deer antler. Exterior surface exhibits traces of red-ochre and green colouring. 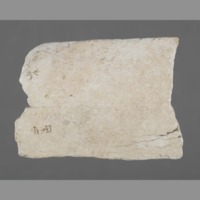 One white and light tan disc-shaped carved stone shard. Flat on one side and convex on the other. 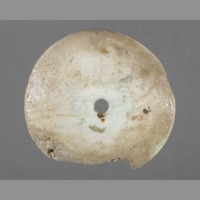 Presents a small circular central piercing. Nearly half of the rim has been broken off. 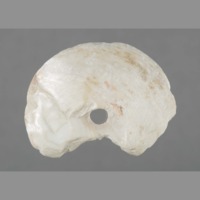 One cream and tan disc-shaped carved stone shard with a slightly hemispherical cross-section. Presents a small circular central piercing. Part of the rim has been broken off. 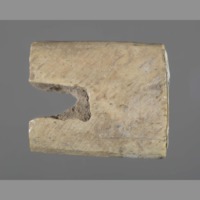 One cream-yellow solid bone fragment in the form of a short flattened cylinder with a large notch cut out of one end. One long slender light brown bone fragment resembling a spatula. Exhibits traces of green colouring. 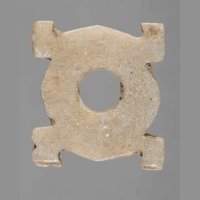 One jade cylinder. Splayed to either end and drilled lengthwise. 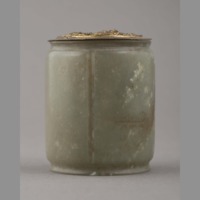 One cylindrical hollowed-out pale green jade ornament with inset cylindrical brass container. Brown vein. 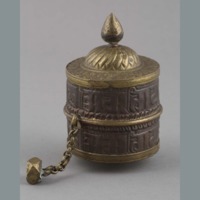 Upper surface of brass container presents moulded dragon design. 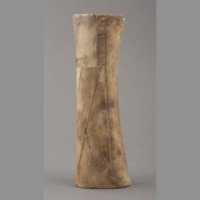 One cylindrical hollow cream-brown bone fragment broken into two pieces. Each piece is filled with clay. 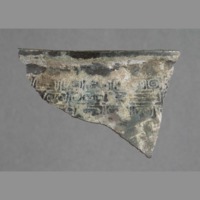 One approximately triangular bronze fragment from the rim of a bowl. Exhibits gray-green patina. 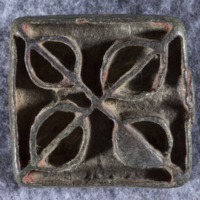 Obverse face presents serpentine pattern moulded in shallow relief. 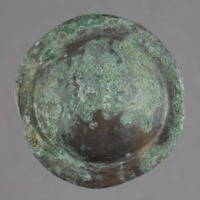 One circular bronze button with patches of brown metal visible amidst blue-green corrosion. Obverse convex with a narrow flat rim. Reverse flat with bar loop. 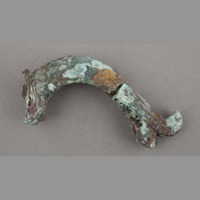 One spade-shaped bronze axe head. Small rectangular flange behind the blade. 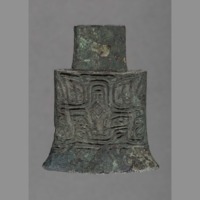 Obverse and reverse present green patina and taotie pattern moulded in relief. 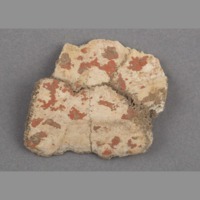 Several light tan and brown turtle shell fragments bearing traces of red-ochre pigment. 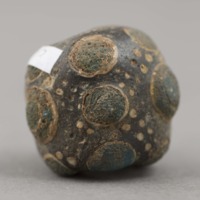 (1) glazed yellow brown and green ceramic in a pattern of discs and dots. One fifth rank ji guan (Chinese court official's hat) insignia. 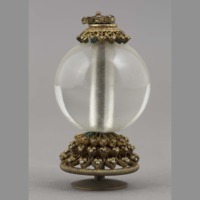 Comprises a transparent glass sphere threaded between a three tier base and double tier cap of gilt metal lotus-like leaf-shaped scrolls embellished with trefoil beads. 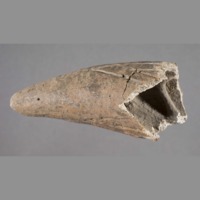 One ornamented bronze tip for a bow. 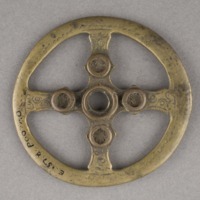 One wheel-shaped ornament with cross in centre as spoke. (1) One cream-yellow bone disc. Large circular central hole. Obverse presents four Chinese characters 一去千裡 (once gone a thousand miles). 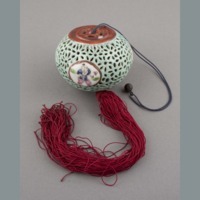 One gourd-shaped qihe (lacquer box). 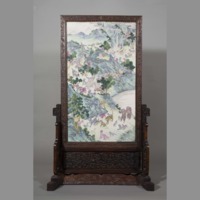 Exterior presents elaborate relief-carved botanical pattern in dark green lacquer. 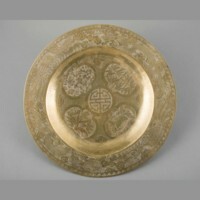 Interior exhibits gilt-lacquered segmented lobe pattern. 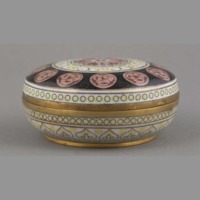 One cloisonne box with lid. 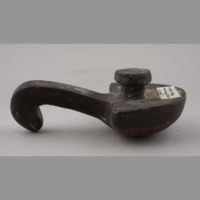 One brown clam-shaped netsuke. Lighter brown markings. 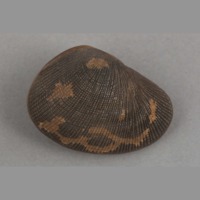 Emulates surface texture and patterning of an actual clam shell. One face presents two small pierces threaded through with light green string. 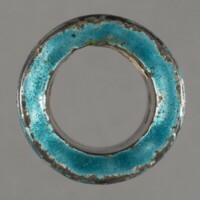 One ring with decoration in enamel. 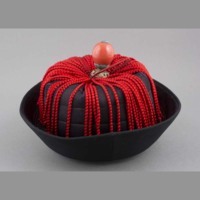 One Mandarin hat. First rank. 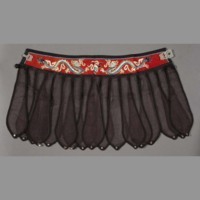 Dark brown silk, with pinky-red coral button on ornamental gilt base, and bright red tassels.